It was a beautiful bright sunny day that Monday in September. There was a flurry of excitement in the tent city of some 3,000 as they awaited the signal to start their new lives. At high noon, September 28, 1891, a shot rang out and the race was on for one of only two Oklahoma cities settled with its own land run. Up the steep hills of Bell Cow Creek they climbed, each anxious to get the choicest to town lots for their homes and businesses. Thus, \"the City of Hills\" was born. The race for townsites was a wild one. Unknowingly in the confusion, some staked out street intersections, alleys, and even on the court house square. But, the excitement died down and the building began. It was an \"inland\" town for railroads didn\'t arrive until 1898. Commuters and supplies came in wagons or stagecoaches. Lumber was either native or usually brought from Guthrie. On March 30, 1897 the town nearly blew away. A vicious tornado severely damaged or leveled all but the First Presbyterian Church. It was used as a hospital for the injured and dying citizens. The hardy settlers began to rebuild immediately. And many of these homes and buildings remain and are in use today. Chandler retains much of the character given to it by these early settlers who have left us their architectural handiwork. Six of them have been declared by the Oklahoma Historical Society to be \"Oklahoma Landmarks.\"
Chandler received its name from George Chandler, an early day judge and later Assistant Secretary of the Interior, and was officially organized May, 20, 1892. National Register of Historic Places The building was building 1899 by L. W. Clapp, Wichita, Kansas financier and mayor. The architecture is termed "Richardson-Romanesque"
The Chandler Golf Course is more than the ordinary 9-hole golf course. It also offers a Practice Putting Green and Driving Range. There is a club house lounge as well as snacks, sandwiches, chips, and cold drinks. There are cart rentals, club rentals, golf accessories, and restroom facilities. 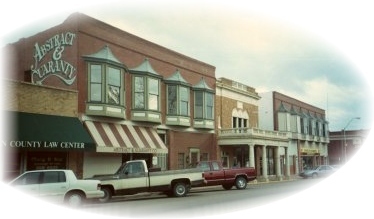 National Register of Historic Places Built in 1898 by O.B. Kee, this mansard-roofed home was purchased in 1901 by famed Deputy U.S. Marshal, William Mathew "Bill" Tilghman, Lincoln County homesteader, sheriff, state senator, and one of the territorial lawmen known as the "Three Guardsmen."